Ask an average investor what she is looking for most. After some prodding, she’ll likely confess that she just wants a hot stock pick — one that will go up — and keep going up from day one. Not that she cares much about the stock itself. It is really about the security the profits represent that matters. It is more about the vacation home, the boat and the secure retirement that the stock represents. Of course, the real world is more complex. There, it is as much about finding and implementing the right overall investment strategy as it is about picking the right stock. One answer is “asset allocation.” Accounting for more than 90% of your overall returns, it’s the decision whether to invest in stocks at all that is more important than which stock to buy. Another answer is to choose the right investment strategy. That may mean putting all your money into Berkshire Hathaway (BRK-B) and letting Warren Buffett manage your money. Yet, thanks to the advent of exchange-traded funds (ETFs), there are plenty of other investment strategies in which you can put your money to work. As it happens, I am somewhat of an “investment strategy” geek. That’s why I monitor, on a daily basis, two dozen or so investment strategies that have a strong record of outperforming the broader U.S. stock market over time. Many have even outperformed Warren Buffett over the past few years. First, there are many different ways to skin the investment cat. Value, growth, buybacks, initial public offering (IPO) investing, insider sentiment and other strategies all approach the market differently in trying to outperform it. Second, much like life, investment strategies have their seasons. No investment strategy works in all markets, all the time. This year’s winners may turn out to be next year’s dogs — and vice versa. In the roaring 1990s, it was the pie-in-the sky Internet story stocks that promised the quickest road to wealth. In the late 2000s, the Commodities Supercycle and the China Miracle were the quickest ways to life-changing fortune. In today’s zero-interest-rate world, it has been conservative, income-generating investments that have been the best bet in recent years. With that caveat, below are the top-three-performing investment strategies that I monitor and their returns versus the S&P 500 year to date. 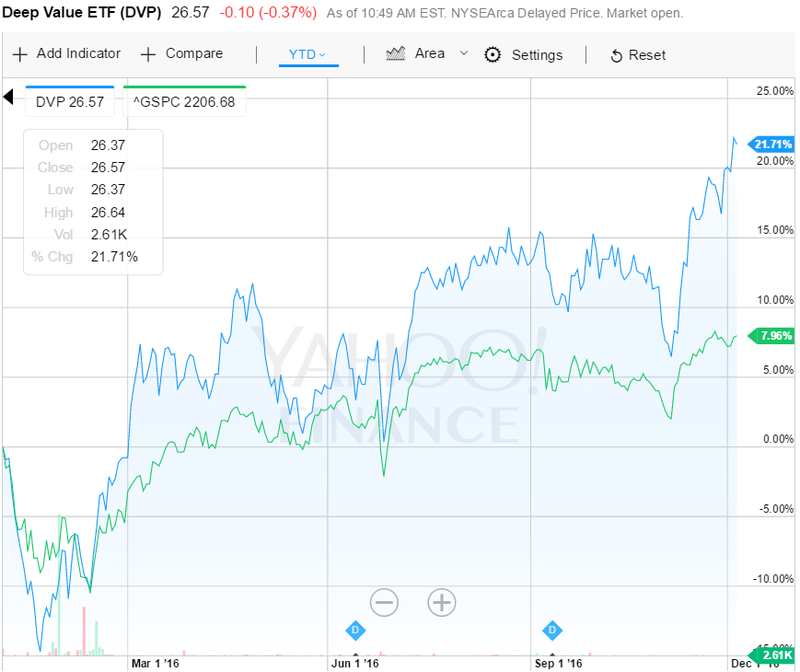 The Deep Value ETF tracks an index of 20 stocks selected from the S&P 500. It identifies undervalued stocks using proprietary quality screens — positive earnings, dividends, etc. — and valuation metrics like enterprise value to earnings before interest, taxes, depreciation and amortization (EBITDA). Holding only about 20 names, DVP shows a big mid-cap tilt and significant sector biases. DVP’s top three holdings are Staples Inc. (SPLS), Transocean Ltd. (RIG) and Whole Foods Inc. (WFM). Year to date, the Deep Value ETF (DVP) has posted a total return (including dividends) of 25.62%. For income-oriented investors, the fund’s 4.16% yield beats the S&P 500 Index’s yield of 2.05%. DVP does charge a hefty 0.80% in annual fees. Between 1957 and 2003, the original “Dogs” outperformed the Dow by about 3%, averaging a return of 14.3% annually whereas the DJIA averaged 11%. The performance between 1973 and 1996 was even more impressive, as the Dogs returned 20.3% annually, whereas the Dows averaged 15.8%. SDOG invests in the five highest-yielding securities in each of the 10 sectors of the market. This generates a portfolio of 50 stocks with a focus on the large-cap market. Higher-yielding shares in the S&P 500 are expected to recover, bringing their yields in line with the market, and leading to outsized gains. By weighing each sector equally at the stock and sector level, SDOG provides diversification while avoiding sector biases. SDOG’s top three holdings are Qualcomm Inc. (QCOM), Cummins Inc. (CMI) and MetLife Inc. (MET). 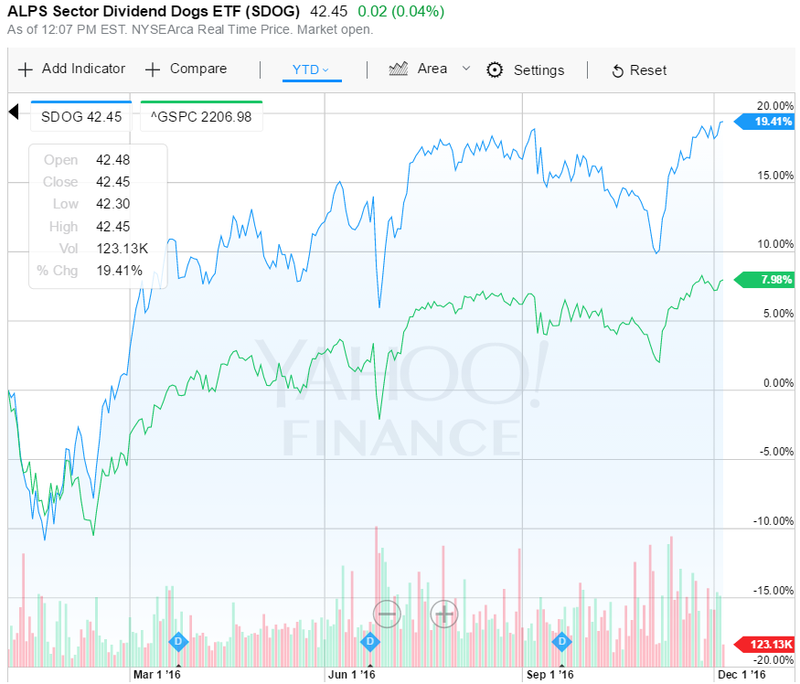 Year to date, ALPS Sector Dividend Dogs ETF (SDOG)) has posted a total return (including dividends) of 22.51%. For income-oriented investors, the fund’s 3.20% yield beats the S&P 500 Index’s yield of 2.05%. SDOG charges 0.40% in annual fees. The small basket of stocks results in a concentrated portfolio and significant sector biases. MOATs top three holdings today are CSX Corp (CSX), Harley-Davidson Inc. (HOG) and Tiffany & Co. (TIF). 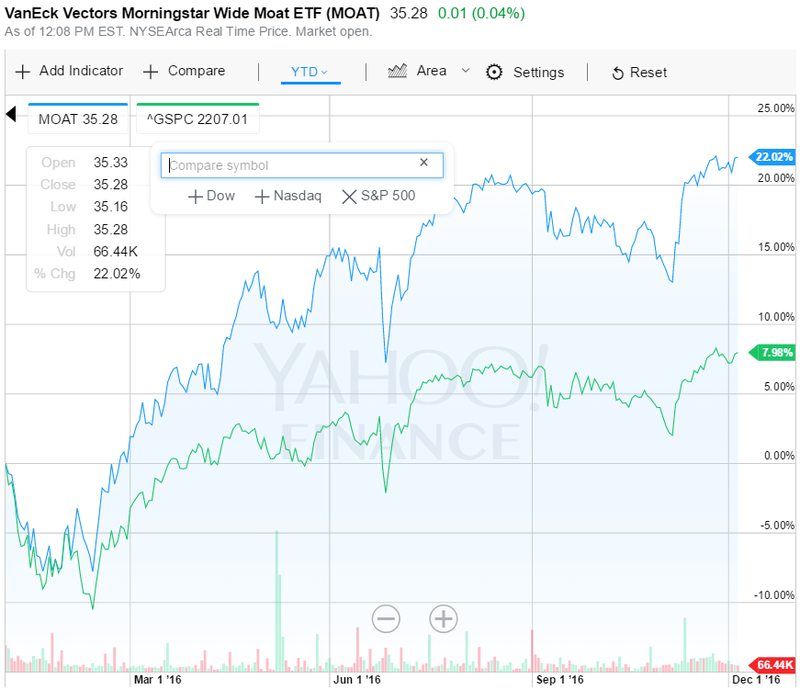 Year to date, the VanEck Morningstar Wide Moat (MOAT) has posted a total return (including dividends) of 21.98%. The fund’s meager 1.76% yield trails the S&P 500 Index’s yield of 2.05%. So this is not one for income investors. MOAT charges 0.49% in annual fees. P.S. These strategies are just three of the 20+ strategies monitored by the investment system I have developed for my trading service, Alpha Algorithm. Using the latest in computer monitoring technology, the Alpha Algorithm tracks in real time, and each week recommends the stocks chosen most often by these market-beating strategies. In case you missed it, I encourage you to read my e-letter column from last week about how long you can reasonably expect the bullish rally to last. Dividend investing expert Bryan Perry explains how recent shifts in the bond market may affect investors' portfolios.